A look at a beauty of a spiral with a very active core. Enjoy! The edge-on galaxy NGC 891 is found in the constellation Andromeda. NGC 891 is approximately 30 million light-years away and is similar in size to our own Milky Way galaxy. 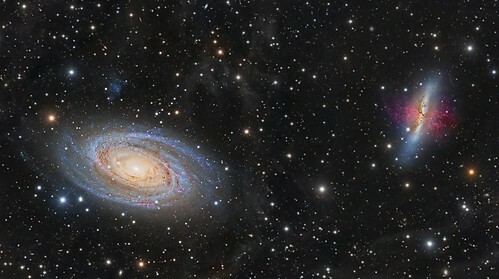 A prominent dust lane is seen in the plane of the galaxy with tendrils of dust seen above and below that plain. 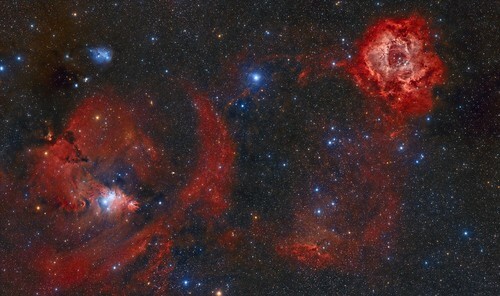 These dust tendrils may be due in part to supernova explosions. The image is a total of 11 hours of exposure through a 12.5 inch f/9 RCOS astrograph with a SBIG STF8300c CCD camera on a Paramount ME taken in Mayhill, NM on the nights of 13, 14 Oct 2016; 16 Nov 2017; 13, 15 Dec 2017, and 13, 19 Jan 2018 (33 X 1200 sec lights @ -15 degrees C; 18 darks, 128 bias; 128 flats). 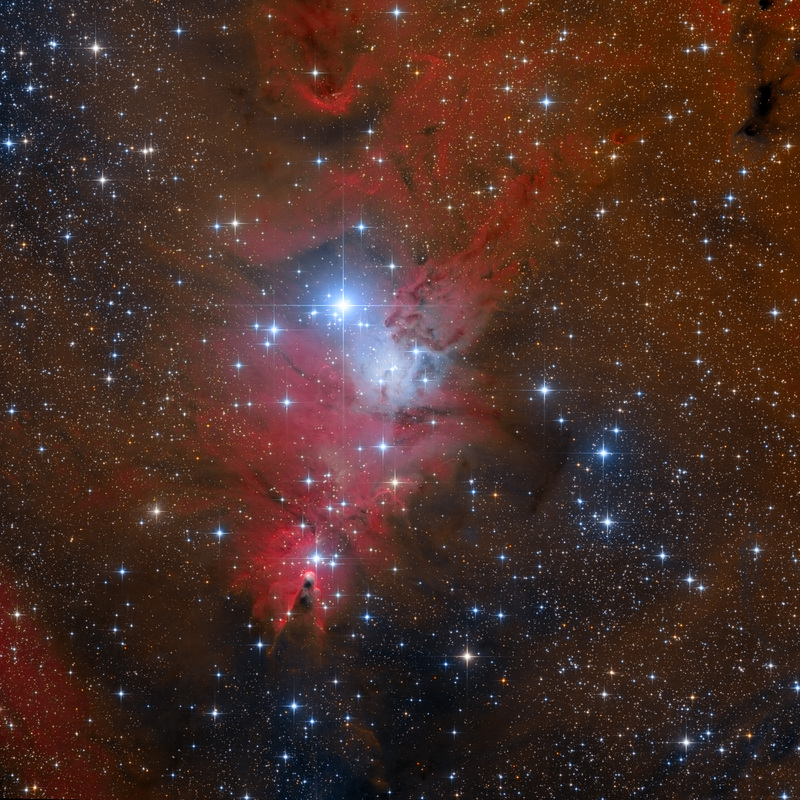 Processed in PixInsight 1.8.5.1353 Ripley (X64). Image taken from Dennes Point, Bruny Island, Tasmania, Australia on 5 January 2018, looking north across D'Entrecasteaux Channel. Foreground cliff is Triassic sandstone, 205-251 million years old, which is relatively young compared with the age of the majority of the stars in the image. Canon 5D MkII, 14mm @ f/2.8, ISO-3200, single exposure 19s. Was always curious what M51 might look like in narrowband. Here I mapped Ha to Red, OIII to Blue and SII to Green with a luminance overlay for detail. Last edited by Rothkko on Tue Feb 13, 2018 10:13 am, edited 1 time in total. Last edited by bystander on Tue Feb 13, 2018 6:51 pm, edited 1 time in total. In mid-January, the news of a nova in Musca arrived. According to the initial observations, this was a 7th magnitude object, bright enough to be spotted by binoculars. After peaking at around mag. 6.7, it started to fade slowly. In 25th January, there was news of another possible nova in Circinus. This nova was reported to be a 9th magnitude object at discovery, but it gradually brightened to 7th magnitude in the following days. This is the view of the deep southern constellations and Milky Way including the both novae, as seen from the rim of Kilauea Caldera, Hawaii. At the time of photography (31st January, 1410 UT, during the total Lunar eclipse), Nova Mus 2018 was at mag. 8.0, while Nova Cir 2018 was at mag. 7.5. Meaning, the annotated version has to include detailed insets for both novae, which could otherwise be lost amongst many other similar looking stars in the deep southern Milky Way. 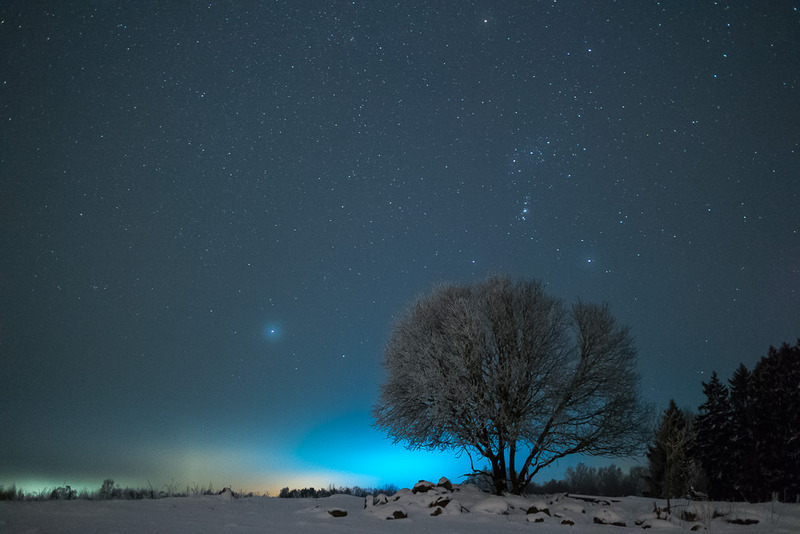 The nigh was frigid and the landscape was desolate. I didn't see another living soul the entire time. However, it seemed as if at one time this was an important place, a place where things occurred. 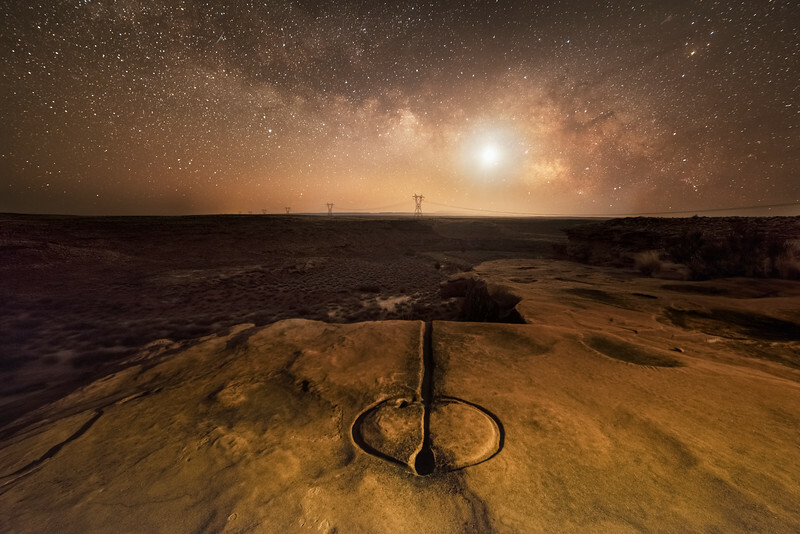 The petroglyph points straight east to where the sun would rise and for me the rising moon, as seen sitting in the core of the milky way. Places like this need to be kept as the are, far from city lights, and the noise of roads. We need places like this that allow us to have one foot in this world and one foot in the other. This is my first photo in this style of this year. Hopefully more will follow. However, It's a challenge to do many in this theme. Driving, finding the sites... Then trying to photograph the site in a way that I can be sure not to damage it. This usually involves predicting composition in the daylight, setting up the camera and leaving everything in place until the appropriate time. Sometimes I'll program the camera to take photographs at a specific time, especially if I don't feel comfortable or if it seem disrespectful to be bumbling around at night. Other times I'll return at a certain hour and take the photo. Usually these photos consume an entire weekend and I usually come away with a single image, sometimes two. I downloaded the publicly available data from the LCOGT network and processed this image. 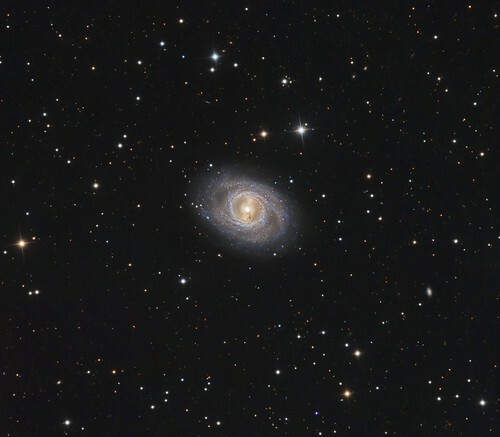 Data for this image was collected by a 1m telescope (1m-08) operated by the Las Cumbres Observatory telescope network at he McDonald Observatory. The Principal Investigator for this data set was BJ Fulton. Thanks for looking! Last edited by bystander on Fri Feb 16, 2018 4:50 am, edited 1 time in total. 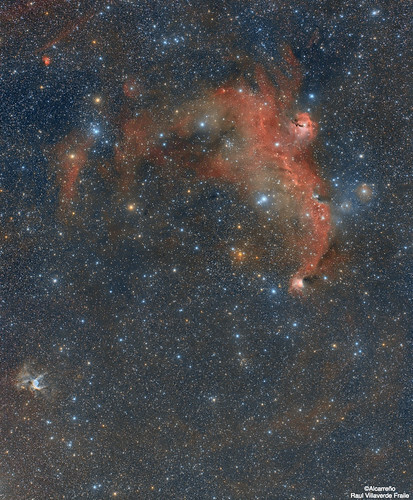 This field of very faint dusty molecular material is a challenge to image and forms part of the much larger Chamaeleon Molecular Cloud. This dusty material fills the constellation of Chameleon and beyond, in the far southern sky, not far from the South Celestial Pole.